Leading a young and dynamic team across Asia, gives me a huge sense of pride and privilege. Working amongst such dedicated professionals, passionate about their country, regions and specialities is truly inspiring and my daily motivation to share this with as many people as possible. Working in an industry that gets the chance to create those "once in a lifetime moments" is fantastic, it is also how I operate, as everyones moments are different, we need to understand clearly what it is that you desire and then make this come alive for you! Treating every single person as an individual, delivering them the moments that they recall time after time, sharing those with their loved ones, to have you reflect on the time with us as the greatest trip of your life, this is what we aspire to achieve! 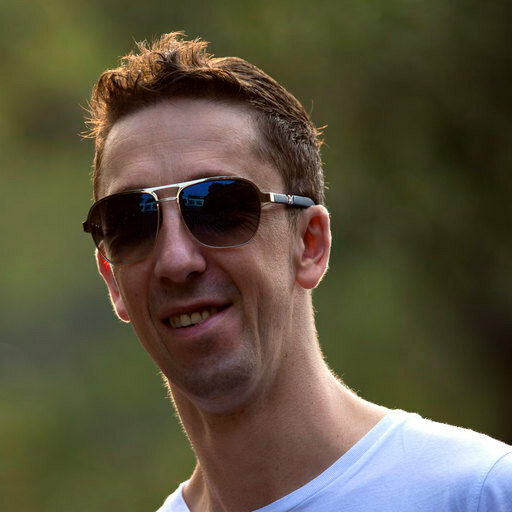 "Travel was introduced to me very early in life, it soon became more obvious it would shape my future far greater than I had imagined, I thought I would be an English footballer, cricketer or swimmer obviously! However, after reality had decided my pursuits of sporting greatness would not be realized, it was clear my passion of travel had already been in place for some time, traveling through Europe and North Africa before the end of my teens, which included many trips on my own even as school boy my desire to see more and international relationships created made this relatively easy to do, well to me it was easy.... Spending holidays exploring Greece and the islands in particular resinate with me to this day, the diversity of the country, the opening arms of the locals, the clear waters and clean beaches, to a teenage boy it was almost enough to make you think you need not venture any further. However, my family did travel further and fortunately they even invited me to join them, before long I had been to many more destinations and continents. As I sat deciding on my future career, looking at another stunning sunset during our "last family" vacation, with no calls about my sporting careers, my decision was a simple one, to make travel not my job but my life. Now, some 21 years later it is still a huge part of my life, one that has taken me further than I ever imagined, living in America for 5 years and now in Asia for 6 years and counting, it is one I am exceedingly happy I made. I love to travel, I love to tell others my tales and expereinces, I love to arrange them their trips and give them the same feelings I have. Whether your first trip or an experienced traveller, I want to make the feelings the same as I have had for so long about travel, that sense of excitement and enjoyment and to return home painting pictures with your words, making others want to leave their comfort zones and travel more.... "
"I have been fortunate to have so many incredible and unique experiences, It is hard to pick one that stands out as they all have special meanings for the time. Watching a shower of falling stars under the clearest skies of Northern Thailand, one after another they fell with crystal clear skies, no light pollution, with just me and my family present is one. Perhaps my first scuba dive experience with sharks in the wild another. Being the first English person a village had ever met in Vietnam another moment that makes you feel the world is still much bigger than we imagine! Being taken in as member of family in Thailand as they prepared the best beef they could afford at that time, it was beef stomach which was at best chewy, the faces of the family smiling made it easy to swallow though. Eating a fresh caught lunch at a tiny tavern on a Greek beach, having to explain although I brought the seafood, I do not eat it. Trying to sell my sister to camel herder in the deserts of Northern Africa, I was offered 3 before my mother realized my intentions... The list is almost endless! For me each travel experience is unique, creating more of them is my passion, now for my family as well. 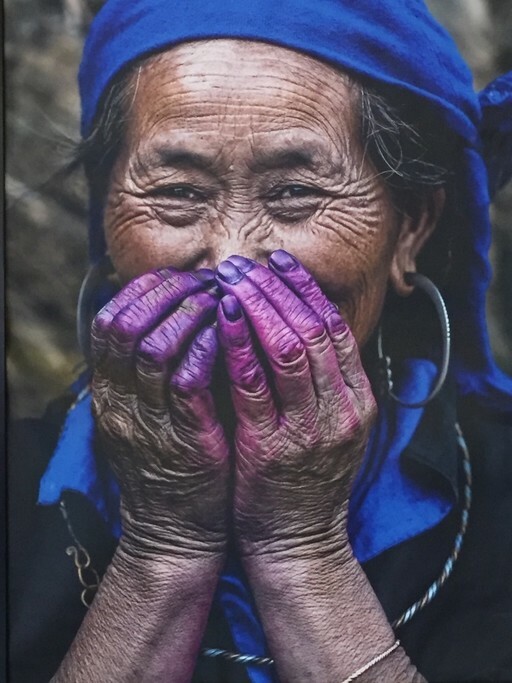 Although they may not be as "
Explore the best of northern Vietnam on this week-long tour. 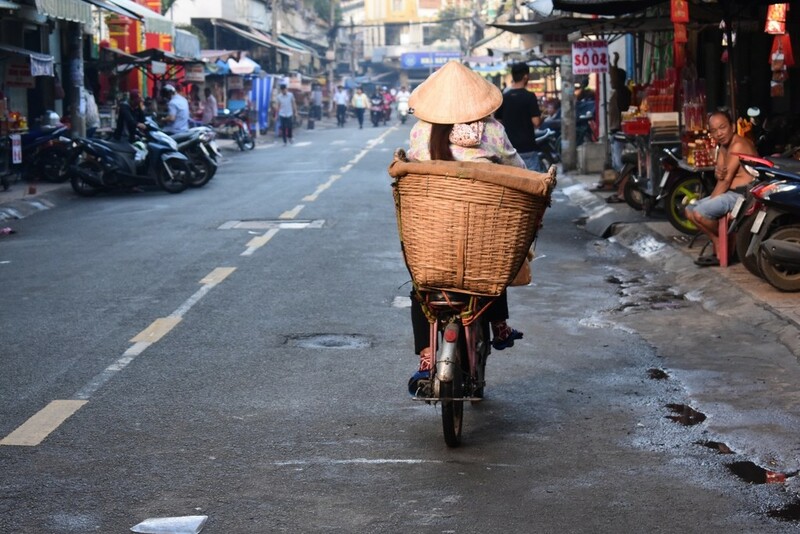 You'll go trekking, explore the Hanoi's diverse architecture, visit local ethnic communities, and end it all with a picturesque boat ride in Hanoi Bay. This week-long tour of the Chiang Mai area of northern Thailand offers the perfect mix of activities for the whole family to enjoy. From exploring the region's stunning waterfalls to playing with elephants to browsing authentic crafts markets, there's so much to see and do. Spend your week cycling, kayaking, and walking around the highlights of beautiful Chiang Mai Province. You'll hike to an ancient temple on a mountain, discover the bustling city of Chiang Mai, and feast on bold northern Thai cuisine. Get ready to spend a lot of time on your bike as you travel to villages in the rolling green hills of the countryside, taste incredible local flavors and home-cooked meals, and immerse yourself in the history of Northern Thailand. You'll explore the impressive temple ruins in the ancient city of Sukhothai, stay with the Karen tribe in their village, and hang out with a herd of wild elephants. Go beyond the stunning islands and emerald waters of Phang Nga Bay, and get a taste of the local lifestyle on this 5-day trip to southern Thailand. 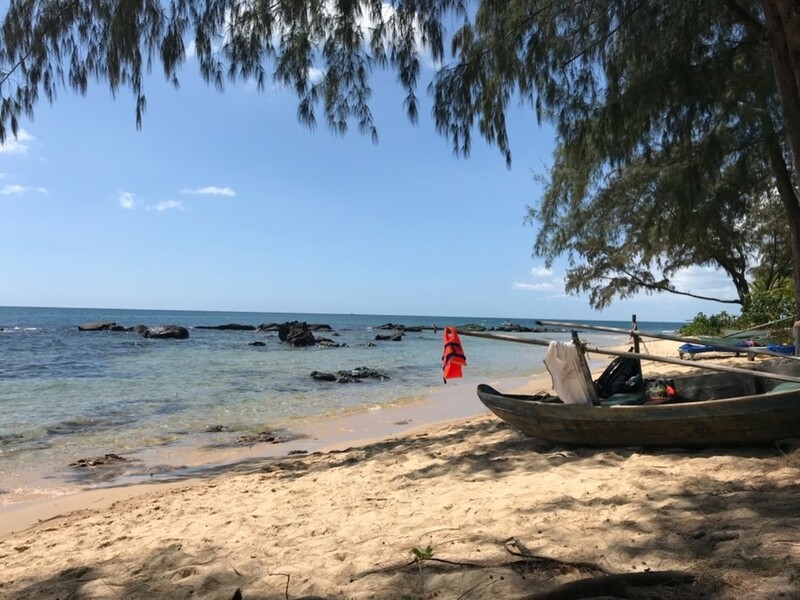 You'll kayak through the lush jungle, unwind on pristine beaches, and eat authentic Thai food with a local family on your homestay in a small fishing village. This trip offers breathtaking views and encounters with the hillside communities that make northern Thailand so unique. You'll visit sacred temples, climb some of northern Thailand's tallest peaks, and experience village culture off the beaten path. Adventurous travelers rejoice: this 14-day itinerary runs the gamut of Thailand's most iconic scenery and sights. You'll bike, river raft, and trek your way to ancient temples, traditional villages, and vibrant night markets. Lace up your hiking boots and prepare to immerse yourself in all this colorful country has to offer. If given the opportunity to use this this site again - I wouldn't hesitate! 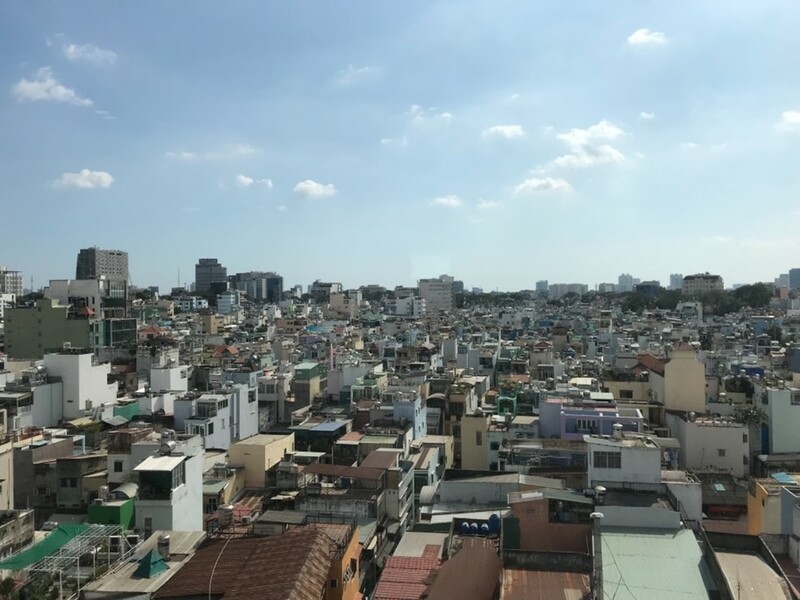 The experience from first conversation with Andy to the last adventure on the Vespa tour of Saigon and each incredible adventure in between was perfection! Our guides and driver in each city (Hanoi, Hoi Ann, Mae Chau, Saigon) were professionals, full of knowledge and fun. 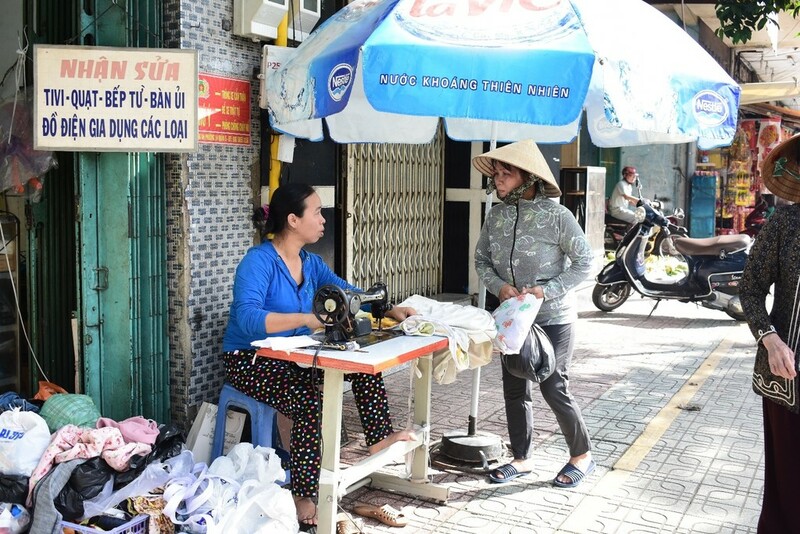 We fell in love with Hoi Ann and wish we could have spent more time there! The ryokans hotels were cheap 2-3 stars rating the most. Should not cost more than USD $200 for 2 for one night. Kim Kim charged us over USD$ 600 for 2 for one night. It was a rip off. We feel this is a lesson we learned and it will be our last dealing with your group, in the meantime we will warn other about your deceptive practice. I you have any decency you should refund us for over charging us. We were so pleased we chose to use your services. Andy, our local specialist, was very attentive right from the beginning of planning our trip. 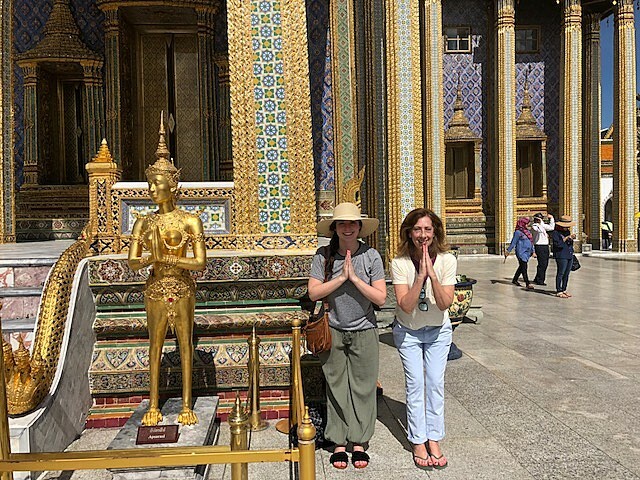 We were undecided about the various places to travel while in Thailand, but knew we were flying into and out of Bangkok and knew we, at a minimum, would want to spend a day or two to visit the Grand Palace and other temples. Both my daughter and I agreed that had we not had a guide to go through the Temples we would not have benefited as much visiting them. Andy employed Mr. Peak to be our guide. Mr. Peak was wonderful! He was not only such a pleasant person, but was knowledgeable about the Temples and River, but also was hospitable and offered so many times to take our pictures at the various places that I believe he knew would capture in a picture wonderful memories for us. We are home and still saying to each other how lucky we were to have a guide, and that our guide was Mr. Peak! Our transports to/from hotel and airports were punctual and easy to find and the instructions Andy gave us to do so were spot on! Thanks for your assistance in our journey to Thailand! 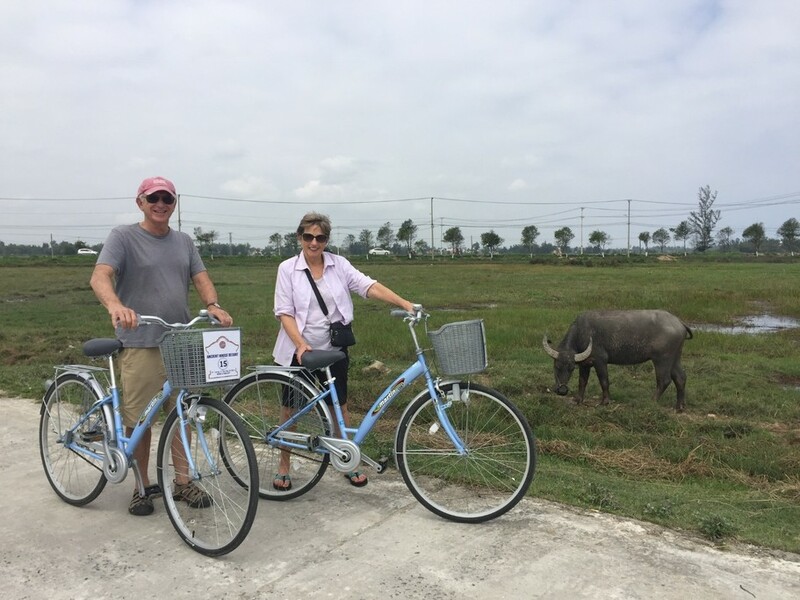 We had a great time touring Vietnam and Cambodia for three weeks. We wanted a trip that covered the main tourist areas, as well as getting out to some of the national parks to see the birds and wildlife. Kimkim put together a package that encompassed everything we wanted to do, and suggested more items too. Everything worked according to plan. We had six different guides in various parts of the countries, and all did an excellent job. All spoke English to a reasonable or better standard, and were a great help in navigating our way through the trip. It was great having such personal attention. The guides were flexible in the itinerary as well. We changed our minds a couple of times about what we wanted to see, and were easily and happily accommodated. 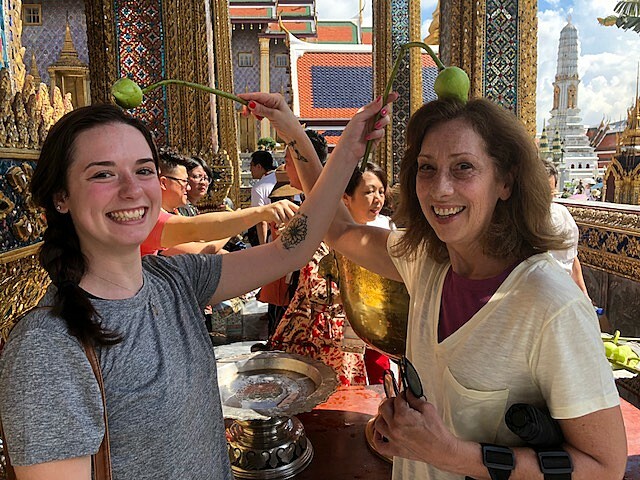 Highlights for the trip would have been seeing the ruins at My Son in Vietnam, and Angkor in Cambodia, as well as some amazing birdwatching tours through Cat Tien N.P. in the south of Vietnam. 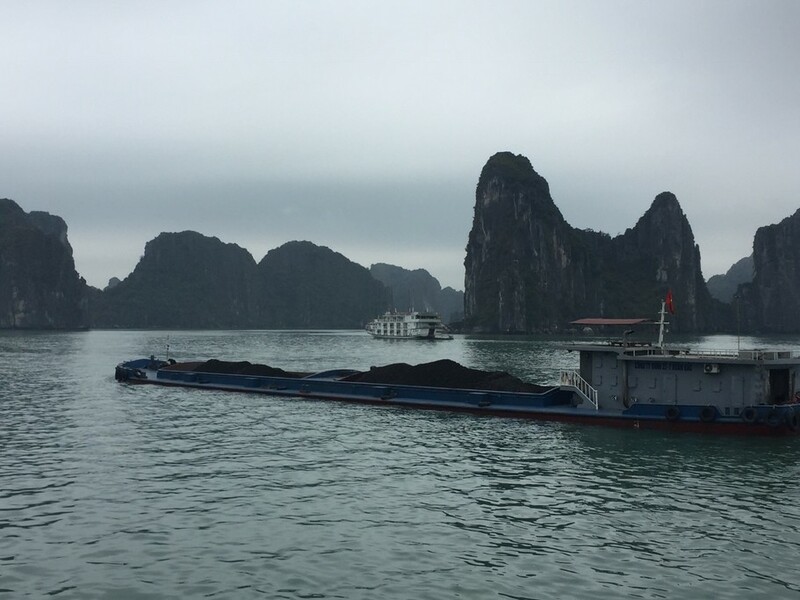 Other memorable moments included kayaking in Ba Be National Park and Halong Bay Bay, and even an impromptu game of volleyball with some locals in a small village north of Hanoi, and all the amazing food that was served to us, especially in small local places. Andy took care of our 6 weeks tour of Asia and everything went well. We had a good time and most of it, drivers, guides, Hotel etc were perfect. I will used Andy again for a another trip for sure. The guides and in country contacts from Exotic Voyages were great. There was one change made to the itinerary after our deposit that was unacceptable. It involved an eighteen hour trip on a non express train. The in country contact (Giang) was wonderful in dealing with the problem, and more than made us happy. Saigon, the Mekong Delta, Hue, and Bach Ma National Parks were great places for visit. Hoi An was also beautiful, but the people being brought in by buses from the cruise ships are destroying what should be a great vacation spot. Siem Reap, Cambodia was everything we expected. The trip out to the large lake was also nice in that it showed the life in Cambodia away from the temple sites. My wife and I just returned from an incredible month in Vietnam and Cambodia. What an incredible blend of culture, history and cuisine. We are recently retired and have always been fiercely independent travelers. I pride myself on my research and trip planning, but being Vietnam, we decided to get some local help. After reading the positive reviews, we selected Kim Kim as our travel platform. They put us in touch with Andy Carroll, the Vietnam expert and the process was flawless. Andy was very responsive and answered all my emails promptly. He put together a proposed itinerary and we worked together on selecting hotels, side trips, museums, cooking classes, etc. Bottom line- 30 days, five internal air flights, one overnight train, one overnight boat, two countries, 10 cities and it was flawless! Every guide and driver showed up on time, the accommodations were truly 4 and 5 star, every mode of transportation was on schedule-- I don't think that would happen in the USA! We are culture and history tourists and the guides Andy lined up were all superior. Incredible knowledge, fairly good but certainly passable English and true ambassadors to their country and their employer. Since we were a tour group of "two", they all went out of their way to ensure we had a fantastic and flexible holiday. The guides and drivers really made the trip!! Using an internet travel company was a big leap of faith for me (would the guides show up, would the hotel have our reservation?) but I can report unequivocally, that KimKim is worth your trust. And I am not a guy who lavishes praise easily!! We booked with kimkim for our week in Vietnam, mainly for travel (car transport, mid-week airfare, lodging, etc. 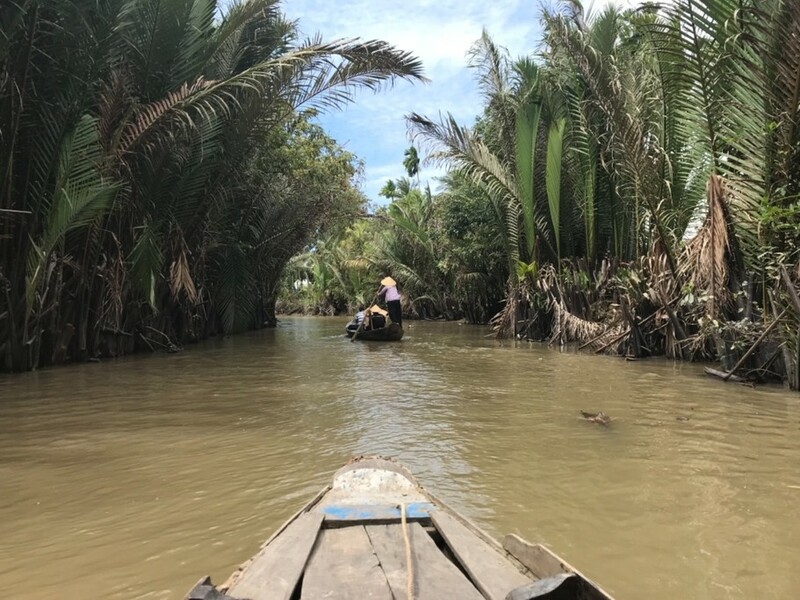 ), as well as one full-day tour of the Mekong Delta. After a small hiccup in the communication during the trip planning, I have to say that everything went smoothly. Transport was on time, the lodging was excellent and had great locale, and our Mekong Delra tour guide, Lucy, was very good. 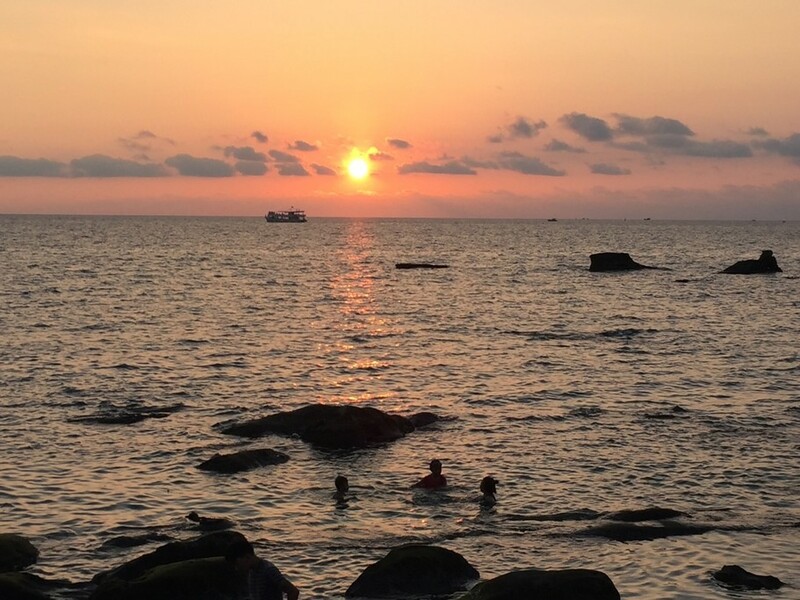 It became clear that we were actually experiencing a local travel agency (that we gave a review for, too), and that kimkim is actually more of a middle-man service, but that's no bother. I would book with kimkim again for their choice of agency and talented guides. Thank you, thank you and thank you again Andy for putting together such an exhilaratingly wonderful itinerary for me in Vietnam !! I loved the way you listened to what I was interested in when we chatted and texted several times beforehand because you really knocked it out of the park for me with everywhere I went !! Each place and all accommodations from the tropical feel of my hotel in the colorful and ancient city of Hoi An, to the gorgeous hotel in the significantly historical city of Hue, then up to Hanoi and my adorable boutique hotel, with an outstanding 2 day side trip out onto HaLong Bay staying overnight on a lovely classy boat, then all the way down to Phu Quoc island only to stay in the magnificent eco friendly resort of Mango Bay and then wrapping it all up in Saigon ... well it was simply just superb !! I loved all of my guides and especially have such fond memories of Mr. Troung and his driver who schooled me with emotional sights and many unknown historical facts of the war. 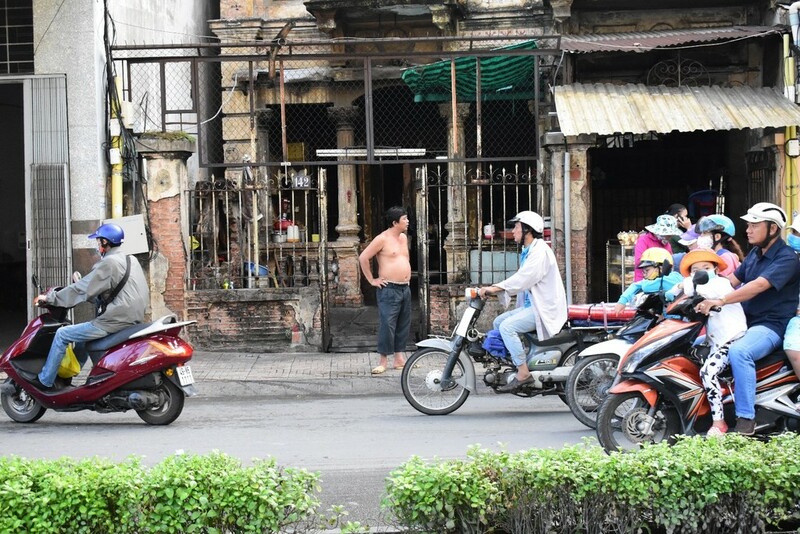 One of my most fun days was deciding to ditch a couple museums and hop on the back of the scooter of my guide in Hanoi and ride with the masses of those who miraculously and artfully flow through the city streets of organized chaos. It was tremendously exhilarating !! I do not typically return to places I've already traveled to for the sole reason that our world is so big and I want to see it all, but I most definitely would return to Vietnam, travel throughout more of the country and hope for more beautiful encounters with it's warm and loving people ... but only if Andy was in charge of making it happen for me !!! Everything from KimKim was great. I had a large group with a lot of moving parts. Andy was calm, cool, and collected each step of the way. I had some people in the group who extended their stays for private tours - Andy helped them each individually and gave them exactly what they wanted. I couldn't have asked for more. The chat setup made communication easy, payment was a simple link, and when one member of my group had an emergency visa problem, KimKim stepped in and got it done in less than 12 hours with concierges service. The entire staff is great at KimKim and they work beautifully together as a team to make everything perfect and more. I will be using KimKim again for groups in the future! Thank you, Andy!! It was my and the entire teams pleasure to work with you and make this trip happen, my only disappointment was not getting the chance to meet you in person! Thank you for such a wonderful review, it really does mean a lot to me and all involved. Thank you as well, for coming to Asia to help others, I am sure those people are even more thankful thank we are. I hope to get chance to meet you on your next journey Amy, it will be my pleasure to assist you again. Had a fantastic trip. Well worth it. I would recommend Kimkim to anyone that would like their trip organised for them. Andy was really easy to communicate with and our guide Dat was very knowledgeable and accommodating. Thank you for such a positive review, it was really a pleasure to help you discover Vietnam. I hope to welcome you back to the region again one day soon. I will be sure to pass your comments on to Dat as well, he is one of our top guides. The trip was simply amazing. We loved all our hotels as well as our guides. The only area we were disappointed with was communication with Andy. He never checked in with us once during our 17 days in Vietnam and Cambodia. When we emailed him from the states he was slow to respond and sometimes failed to address our questions. When we emailed him from Vietnam he was slow to respond, sometimes inaccurate in his responses and one time failed to respond at all, regarding a timely issue. The trip planning was great. Trying to get 7 people organized was like trying to herd cats, but all our requests were handled well. It was a real pleasure to assist you all, I am just happy you all enjoyed your time here. If I can ever be of any assistance i'd be more than happy to help you with the herding. Andy went through all the details prior to our visit, so when we arrived, the trip was tailored to exactly what we had asked. The organization, once we were in Vietnam, was excellent. Someone was always waiting to meet us, and the guides were all friendly and informative. No effort was spared to make little tweaks and changes. Correspondence was friendly and made us feel very comfortable about trusting Andy with our trip. Thank you for such a lovely review, it was my pleasure to help you arrange such a big and exciting trip. Not to mention with a birthday involved too. Thank you again for joining me for a beer or two here, it was a lovely evening. The guide Ngoc was really excellent. very knowledgeable, helpful, punctual and happy to move things around ( e.g lunch booking when we opted to leave Sapa early because of the rain) . A great guy we'd be happy to recommend to friends. Overall, the trip was very good. There could have been a lot more communication about the daily itinerary and I wish that there had been more optionality provided for what was done each day. For example, when visiting the Elephant Sanctuary, there were several tour options that the sanctuary provided, but one of the tour was just selected for me without providing me an option (when I would have preferred to be on another tour). Also, I feel like many of the days ended the activities earlier than expected without any option to visit more sites or deviate from the itinerary. Overall, while the tour was great, I was expecting more for the money that I paid (even despite the fact that I realize I paid a premium for being a solo traveler). Andy was phenomenal in some respects, especially when I was presented with a health issue. But again, some of my comments about the optionality of the trip and the communication could have applied. I think we could have come up with a more tailed trip for me if I had been provided more options and there had been more communication.